We saw our first sighting of the Asus MeMoPad at the tail end of last year when Asus officially confirmed it! Today the company has shown off a new little YouTube video which shows you some of the little tricks which Asus is hoping you'll be using the device for! Just in case you need a refresher then this device is basically Asus' answer to the new budget Iconia B1-A71 from Acer! So remember to not expect the earth, but there is; Android 4.1 Jelly Bean, a 1GHz VIA WM8950 CPU with a Mali-400 GPU, 8 or 16GB of internal storage, 5GB of Asus WebStorage, 1GB of RAM and a 1MP front-facing camera which can manage 720p video! As well as, the normal range of connections and a 10-point multi-touch LED-backlit display with 1024 x 600 resolution, 140-degree viewing angles, which can also manage 350-nit brightness. The whole thing will run for about 7hours on the 4270mAh battery. With all of that coming in at an RRP of $149 USD, we think this is very reasonable and it should prove to be a relatively popular tablet! So check you the video and let us know your thoughts in the comments below! Is the Nexus 7 worth the premium over this? Fremont, CA (January 13, 2013) - ASUS is excited to introduce the MeMO Pad™, a stylish and capable 7-inch Android tablet designed for mobile consumers looking for a high-quality yet remarkably affordable tablet. With a starting MSRP of $149 (US), the ASUS MeMO Pad™ features Android™ 4.1 and offers full support for Google Play so you can choose from over 750,000 apps and games, browse the world's largest eBookstore, search millions of songs, watch thousands of the latest and greatest movies and TV shows, and even flip through your favorite magazines*. Available in three colors – Sugar White, Titanium Gray and Cherry Pink — MeMO Pad™ sports an elegant, non-slip diamond-patterned finish in a thin and lightweight design. 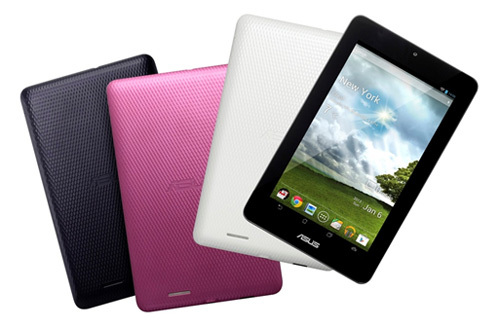 ASUS MeMO Pad™ runs Android 4.1 Jelly Bean and is powered by a 1GHz VIA WM8950 CPU and a Mali-400 GPU for a smooth and fluid entertainment experience. It features a 10-point multi-touch LED-backlit display with 1024 x 600 resolution, 140-degree wide viewing angles, and its 350-nit brightness means images remain clear, even outdoors. MeMO Pad™ also features ASUS SonicMaster audio and MaxxAudio for high-quality sound.